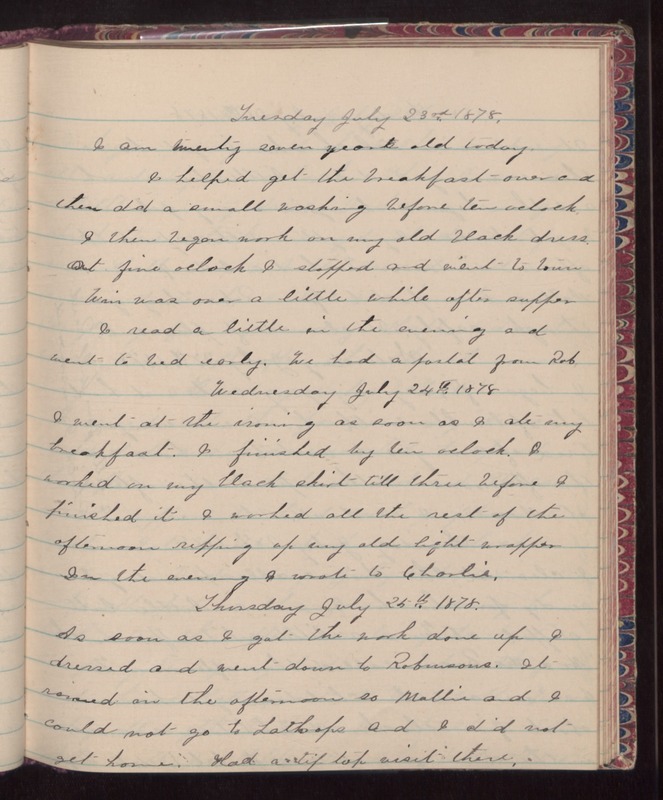 Tuesday July 23rd 1878 I am twenty seven years old today. I helped get the breakfast over and then did a small washing before ten oclock. I then began work on my old black dress. At five oclock I stopped and went to town. Was was over a little while after supper. I read a little in the evening and went to bed early. We had a postal from Rob. Wednesday July 24th 1878 I went at the ironing as soon as I ate my breakfast. I finished by ten oclock. I worked on my black skirt till three before I finished it. I worked all the rest of the afternoon ripping up my old light wrapper. In the evening I wrote to Charlie. Thursday July 25th 1878 As soon as I got the work done up I dressed and went down to Robinsons. It rained in the afternoon so Mollie and I could not go to Lathrops and I did not get home. Had a tip top visit there.